﻿﻿﻿﻿﻿One thing I insist on doing with every team is using a physical task board. I like to visualize work to understand the flow and spot bottlenecks and impediments. Plus, it makes it easier to hold a daily stand-up meeting. You have something visual to refer to. 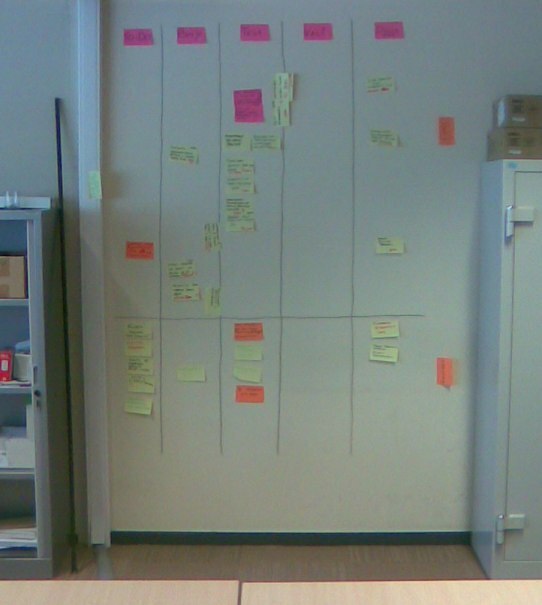 But what do you do when there is no whiteboard available to put up your post-its? It’s simple, just get somebody over to hang one up for you! That might not always be possible. Suppose you have really thin walls. Drilling a hole in them is not preferable. Or you don’t have any walls, the building mostly consists of glass. No, there’s another option. Forget the whiteboard. Just create swimlanes directly on your wall or window by using colored tape. If you don’t have colored tape, use transparent tape and color it with a marker. Column definitions can be written on post-its, which we stick above. You’re not restricted to the size of the whiteboard. You can go wider and higher. If you’re doing Kanban, you can have all the columns you like. Post-its stick better on walls. Whiteboards tend to get greasy, which makes post-its falling off, which makes me unhappy, which makes me want to tear the whole thing down… Oops, sorry for that! You can use your whiteboards for drawing, designing, brainstorming,… The stuff it’s supposed to be used for. Conclusion: There are not a lot of excuses left for not having a physical task board. All it takes is a wall (or window), some tape, post-its and a marker. I guess you can all afford that, right? Advantage compared to using the wall or window directly is that you can write on these papers, and you can take them of and move your taskboard (into a meeting room or where-ever).